The Glistening Inkcap was @SpeciesofUK from 17th to 23rd February, 2014. The glistening inkcap is a fungus that is often found growing around dead wood. 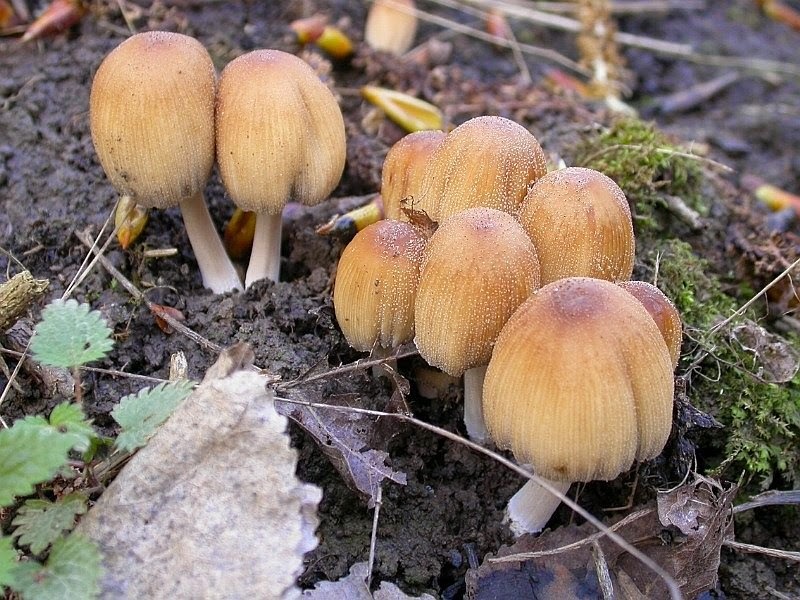 It used to be known as ‘mica’ inkcap on account of the tiny granules that glisten on the surface of immature specimens. 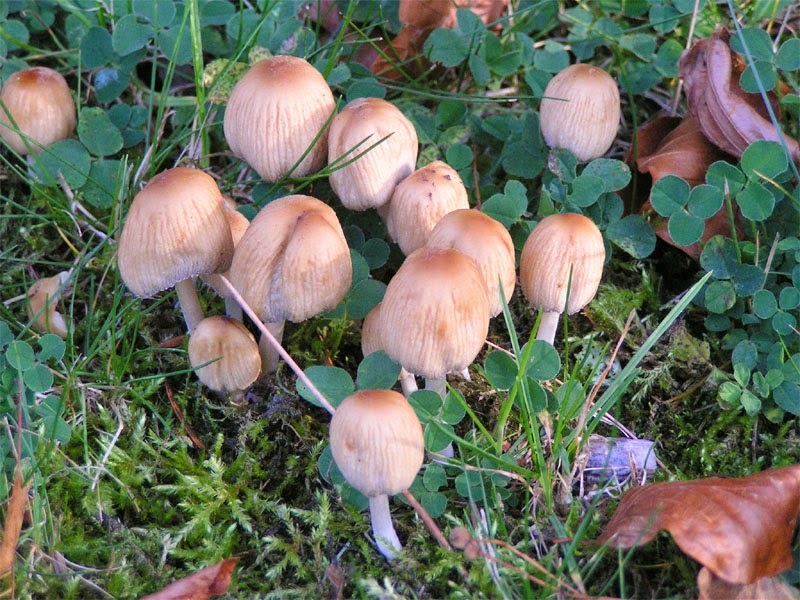 Glistening inkcap is extremely widespread. It's common in Europe and North America and also most parts of Asia, South America and Australia. Glistening inkcap is a fungus of the Psathyrellaceae family. Fungi are a kingdom of life in their own right, just like animals and plants. Unlike plants, which have cellulose in their cell walls, and animals, which have no cell walls, fungi have cell walls containing chitin. No one knows how many fungi species there are. Estimates range from 1.5 to 5 million with about 5% discovered so far. Most fungi are tiny and inconspicuous, living underground, on dead matter, in symbiosis with other organisms, or forming yeasts and moulds. Glistening inkcap falls into the Psathyrellaceae family of fungi, a type of ‘dark spored agaric.’ It is a member of the Coprinellus genus. 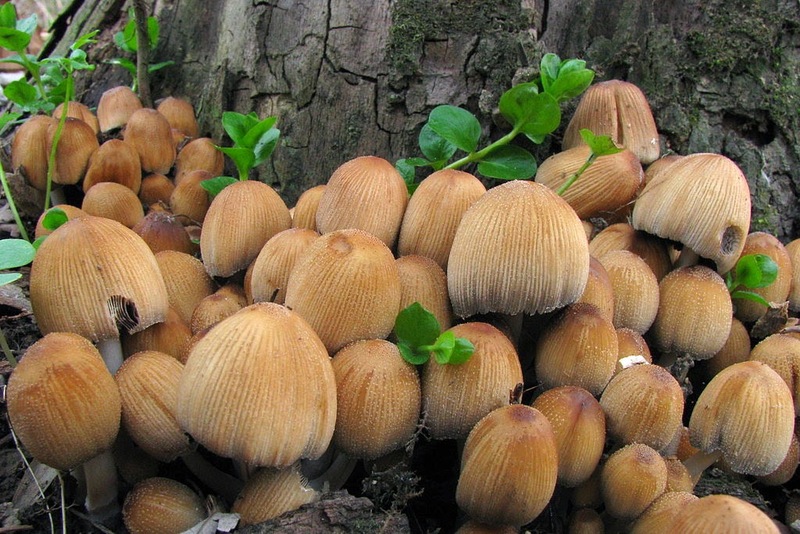 The taxonomic history of glistening inkcap is a little complicated. 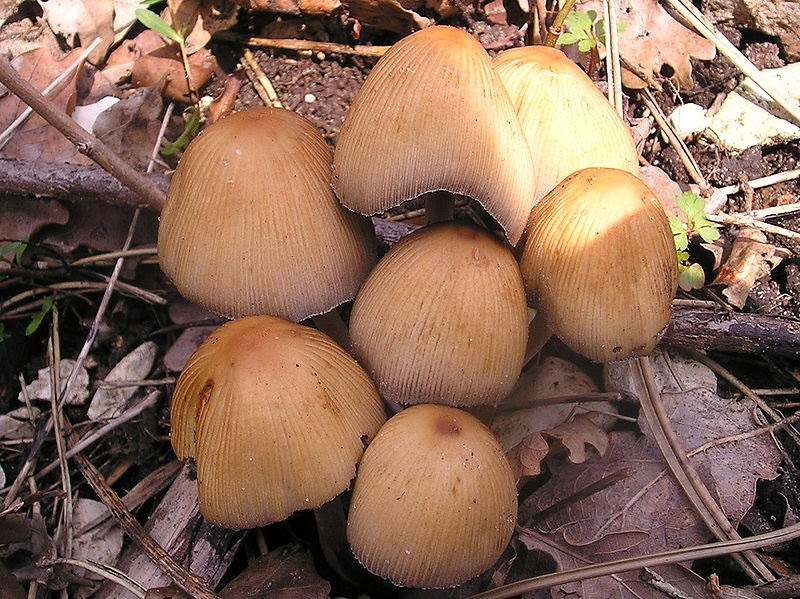 Originally, in 1786, glistening inkcap was classified in the Agaricus genus along with most other gilled fungi. Agaricus has since been split out into numerous groupings. 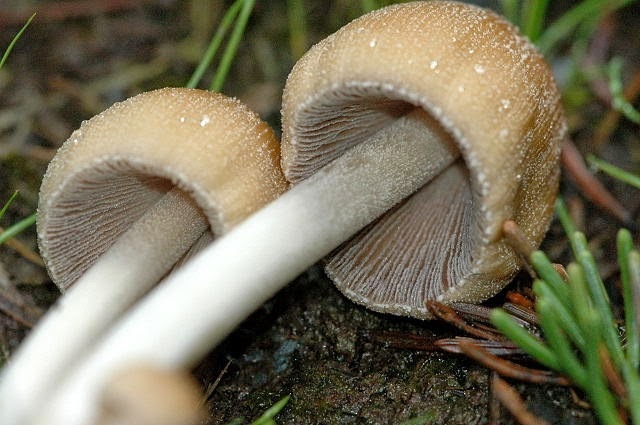 But in 2001, the glistening inkcap was reclassified yet again based on DNA analysis and placed in a new genus called Coprinellus, where it remains today. 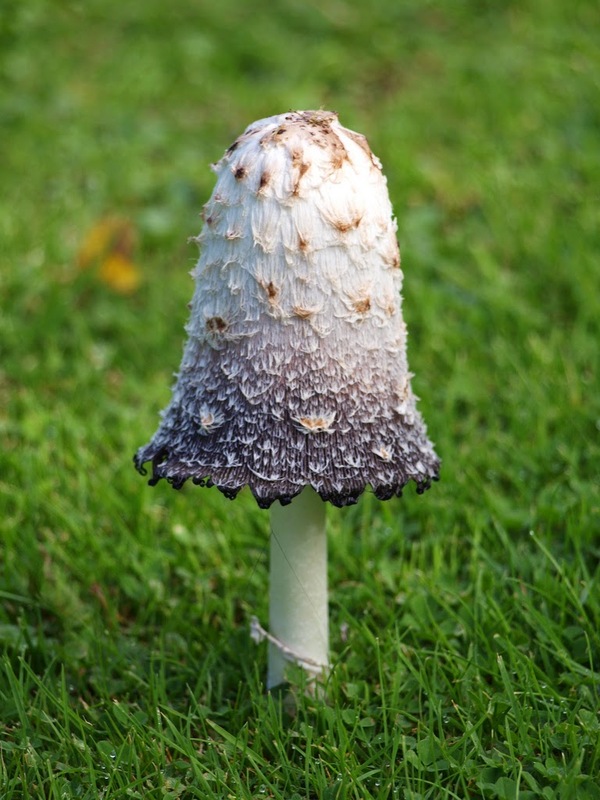 The name 'Coprinellus' refers to the fact that glistening inkcap was thought to live on dung, like the Coprinus species – confusingly, it doesn't! The 'ellus' indicates a smaller size. 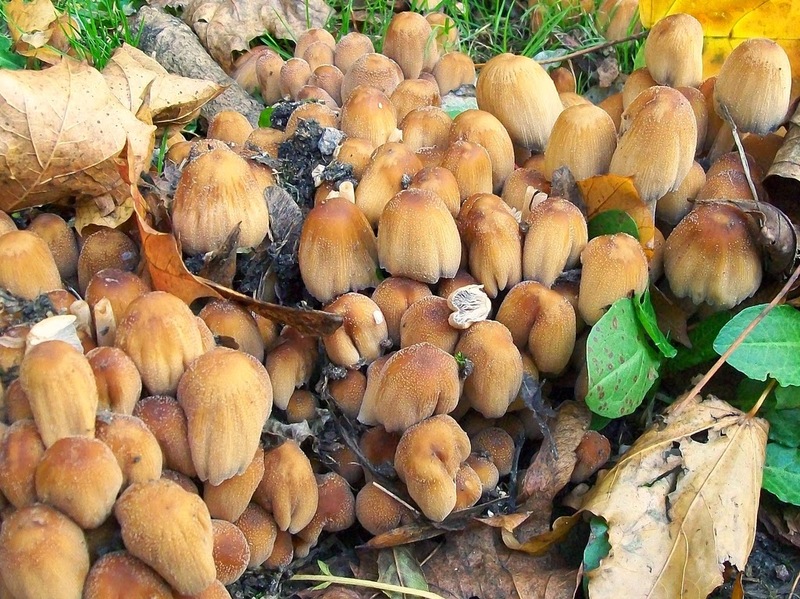 In wet weather the mica-like granules of glistening inkcaps are washed away so that mature caps are entirely smooth and stop glistening. Glistening inkcap grows on tree stumps or buried wood. 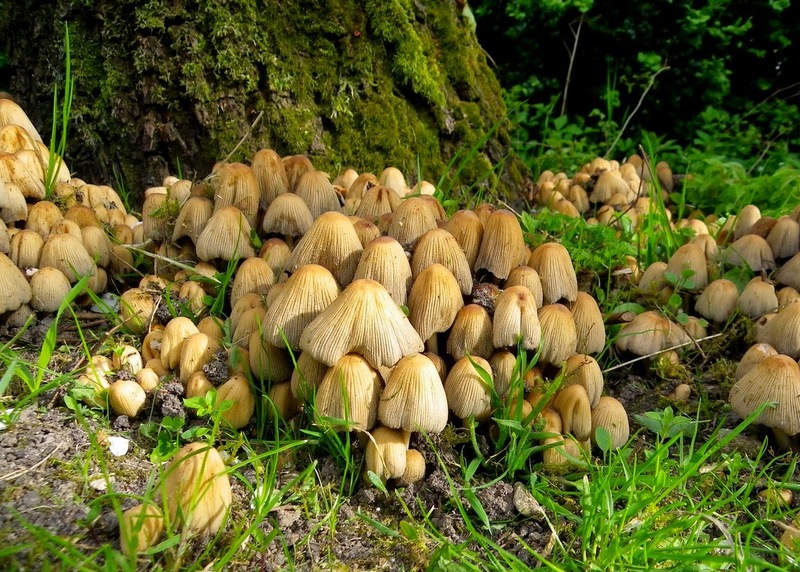 Glistening inkcap arises in clusters around tree stumps, from spring until early winter (most of the year, really). You’re most likely to see it in spring. 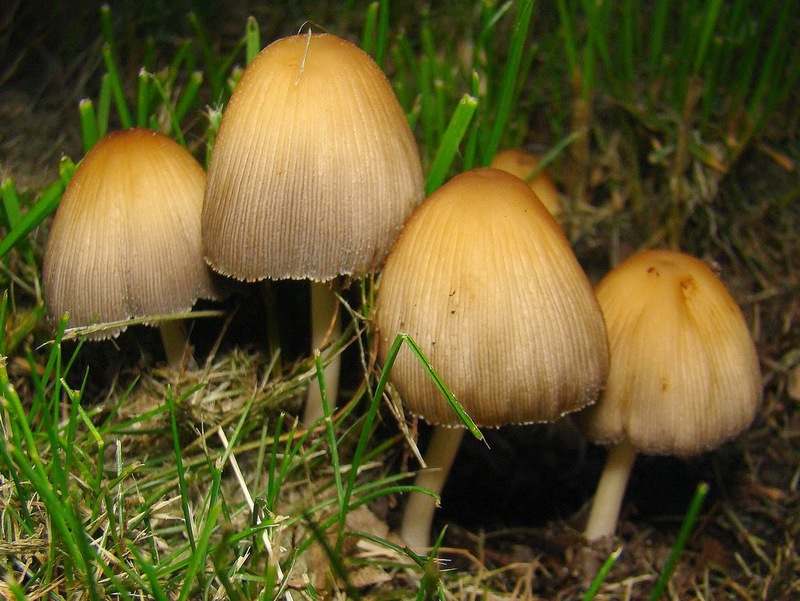 Glistening inkcap can appear to grow directly on the grass, but it is really growing on dead wood under the ground. Glistening inkcap becomes bell-shaped as it matures. The stems of glistening inkcap are white, but brownish at the base, and they can grow surprisingly tall, from about 4 to 10cm. 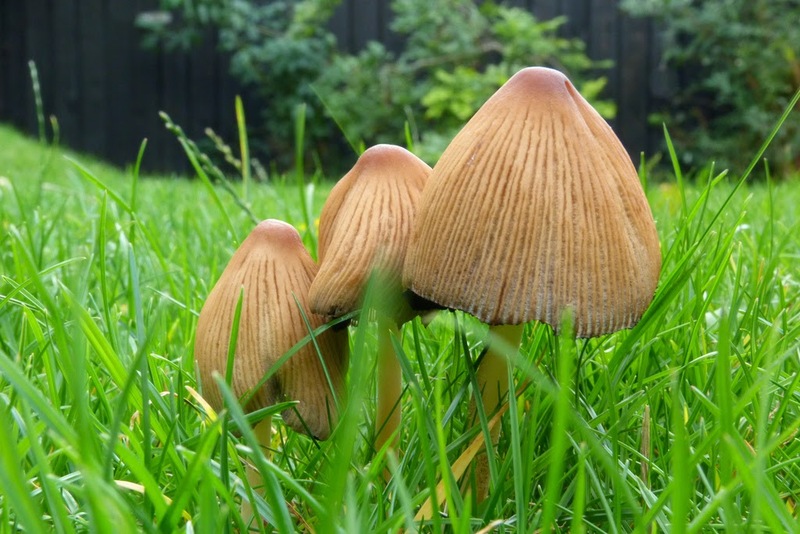 As they mature, glistening inkcaps become more bell-shaped. 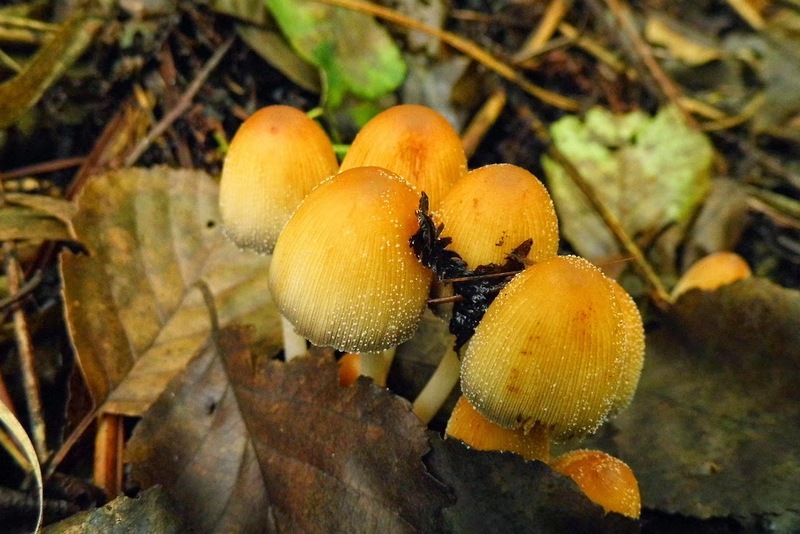 The cap colour of glistening inkcap is ochre-brown or tawny with a russet central 'eye'. They darken when moist and turn grey-brown as they age. The cap has a split or sometimes rolled-back margin that is lined and grooved almost to the centre. The gills of the glistening inkcap are attached, dense, white, slowly browning then blackening with age. Glistening inkcaps deliquesce (dissolve) after ageing, from the margin inwards. Glistening inkcap is edible but can be poisonous if collected from polluted land/roadsides where cadmium and lead can accumulate. Glistening inkcap produces both spores and clones. Glistening inkcap, like most fungi, reproduces in two ways: sexually, by releasing spores; and asexually, by cloning cells underground. The spores are basically special cells containing one nucleus (normal fungi cells have two nuclei), that are released from the mushroom cap. 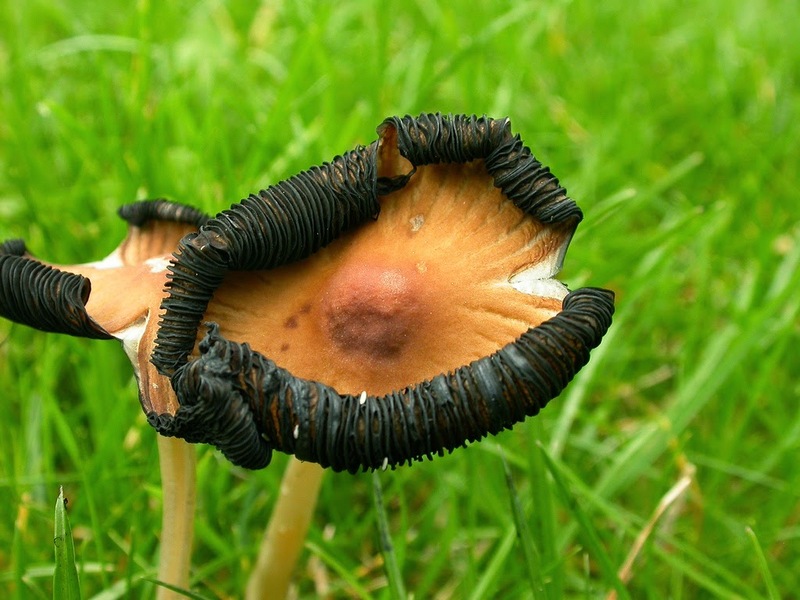 Glistening inkcap spores are ellipsoid or shield-shaped, smooth, making dark brown or black spore prints. When two fungi spores combine they form a new cell with two nuclei ready to grow into a new organism. Sexual reproduction is complete. Asexual reproduction happens in the body of the fungus which is underground. The cells clone, slowing spreading the hyphae of the fungus further and further. 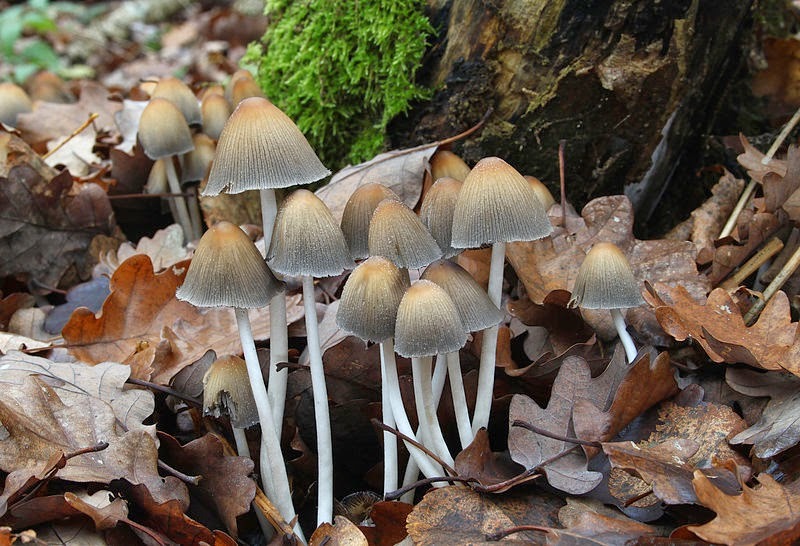 Due to its habit of growing on dead wood hidden from view under the ground, it’s been said that glistening inkcap marks the graves of dead trees.